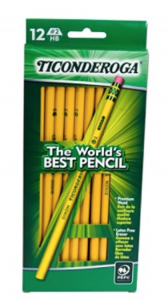 Dixon Ticonderoga #2 Pencils 12-Count Just $1.25! Head overt to Office Depot/Office Max and snag some Dixon Ticonderoga #2 Pencils 12-Count for just $1.25! (Regularly $3.79) Grab some for home and donate some to your kids classroom! Be sure to select free in-store pickup to avoid shipping fees. You can drop the price to $1.19 if you choose to subscribe to this item. There is a limit of 12 per customer.